There's nothing more refreshing and simple than a classic gin and tonic, a simple highball of gin and tonic water over ice with a slice of lime for garnish. The army of the British East India Company took Scottish doctor George Cleghorn's discovery that quinine could prevent and treat malaria to heart and began to drink quinine water to prevent the disease. Since it was bitter and unpleasant they took to adding a bit of sugar, their daily ration of gin and a squeeze of lime to their medicinal quinine around the early 1900s and the Gin and Tonic was born. Though tonic water today contains much less quinine, the G & T remains a classic British cocktail to this day. They even have a popular lemon garnish version known as the Evans. Like anyone else, when it's hot and muggy outside I enjoy a good gin and tonic, in fact it doesn't need to be very hot or at all muggy. 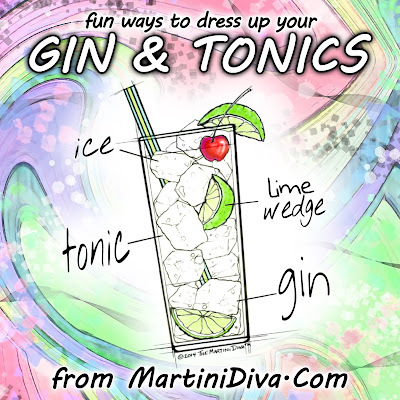 There is no specific recipe for a gin and tonic, it's a drink that is usually mixed to personal tastes so you can play with the ratios of gin to tonic for a stiffer or lighter alcoholic drink. I have also found it's very fun to play with the basic recipe by adding some extra flavoring agents. I particularly like to add cucumber, berries and herbs but I have been known to add teas, fun liqueurs and/or flavored simple syrups. The Gin and Tonic is a very forgiving and versatile cocktail. Try some of your own versions by adding favorite fruits, different sweeteners like favorite liqueurs or flavored honey, even some homemade flavored simple syrups. International Gin & Tonic Day is October 19th, National Gin & Tonic Day is April 9th, National Gin Day is November 7th and World Gin Day is June 10th.